What an amazing collection of bear activities for kids! It contains crafts, printables, books, and more! You’ll find everything you need to keep your kids engaged and learning all about bears! I love focusing on one topic at a time with my preschoolers. It allows us to dig deep and dive in as much as we want. 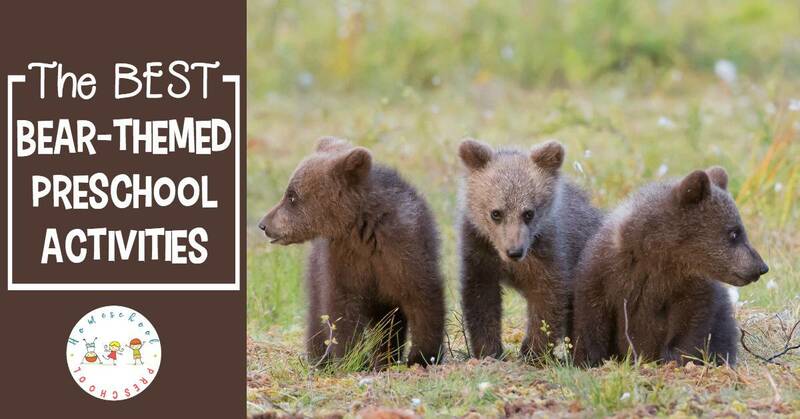 If you are studying bears, zoo animals, or woodland creatures, I have just what you need to build an amazing bear-themed unit study for your preschoolers! I love teaching preschoolers about animals. They are intrigued and fascinated by everything at this age. Since there is no shortage of books, printables, and themed resources to incorporate into the activities, the possibilities are endless. Below, you’ll find all of the posts I’ve written to date that feature bears. This is an ever-growing list. Be sure to check back frequently, though, because I’m always adding new posts to this list. • Simple Fork-Painted Bear Craft – Preschoolers will love creating this simple fork-painted bear craft. Using a fork instead of a paint brush creates a unique texture that kids will love. 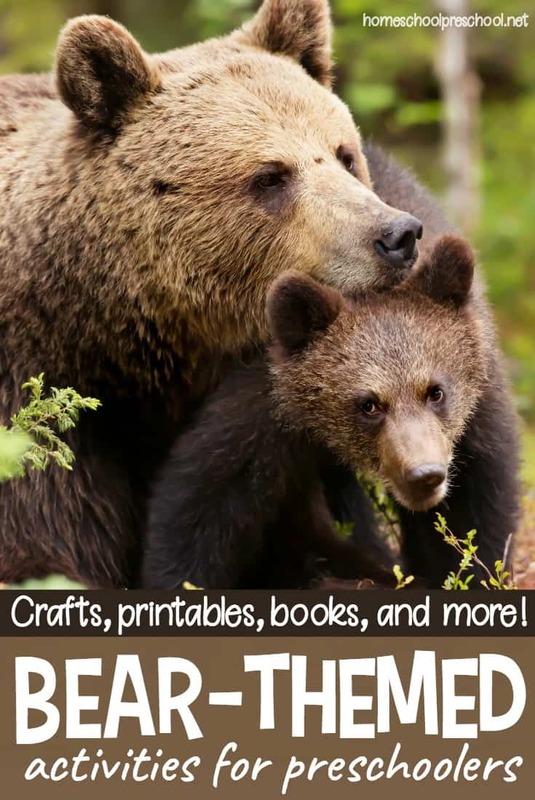 • Bear Crafts for Kids – Most kids I know love crafting, and these bear crafts for kindergarten and preschool will go great with all of your bear themed units and activities. Check out all 19 ideas! • 33 Preschool and Kindergarten Bear Printables – This collection of bear printables is perfect for preschool and kindergarten students. You’ll find worksheets featuring bears, polar bears, counting bears, and more. • Bear-Themed “Build the Number” Preschool Counting Worksheets – These preschool math printables will help your little ones recognize, count, and write the numbers 1 – 20. These bear-themed preschool counting worksheets are perfect for extra practice! • Bears Preschool Learning Pack – This pack is all about bears. Preschoolers will have fun working on beginning math and literacy skills with this brand new bears preschool learning pack. • Bear’s Loose Tooth Mini Pack – Prepare your preschoolers for their first loose tooth with some quick, fun activities to go along with Bear’s Loose Tooth by Karma Wilson. • Bear Themed Cutting Practice Worksheets – These preschool worksheets provide much-needed cutting practice for little hands. They provide an opportunity to build fine motor skills. • The Little Mouse, the Red Ripe Strawberry, and the Big Hungry Bear Mini Pack – Discover fun and engaging printable The Little Mouse, the Red Ripe Strawberry, and the Big Hungry Bear activities that are perfect for tots and preschoolers. • 12 Delightful Picture Books About Bears – My kids can never read too many bear books. They love polar bears, grizzly bears, and brown bears. They hug their teddy bears and recite with me. Here are 12 delightful picture books about bears and teddy bears! • 5 Tips for Celebrating “Have a Party with Your Bear Day” – Did you know that November 16th is Have a Party with Your Bear Day? And can you imagine a better way for your preschoolers to spend a rainy afternoon than having a party with their friends and teddy bears? • How to Make Teddy Bear Toast – Teddy bear toast is a quick and easy breakfast or snack for preschoolers. Encourage your little ones to eat a healthy treat with toast that looks like a bear.